Aries came in with his 'sister' Aurora. Their owner could no longer care for them. Aries and Aurora are not doing very well in the shelter. They had lived quietly in a home with an older gentleman, so shelter life is pretty scary for them. They would best do well in a quiet retirement home where they can live out their remaining years in comfort. 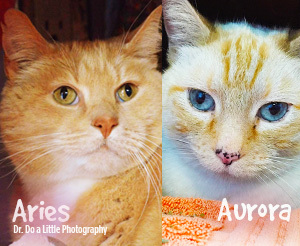 Aries and Aurora are both sweet cats that do enjoy being pet and being brushed. Will you be their last and forever home? For more info, please speak to the staff at the Vernon & District BC SPCA.